The founder of online firearms marketplace GunPost.ca says an attempt to illegally buy a handgun by a customer who said they didn't actually have the proper licence to own the gun is a "rare instance." 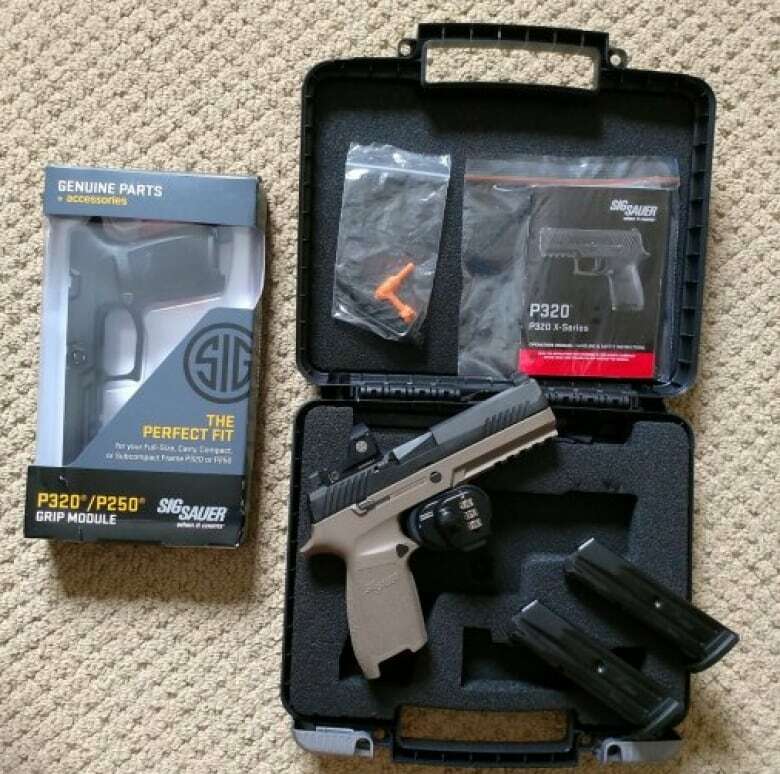 The founder of online firearms marketplace GunPost.ca says an attempt to illegally buy a handgun by a customer who isn't properly licenced to own such a gun is a "rare instance." Only two potential buyers have been reported for trying to purchase firearms without the proper licence since the site was created in 2014, said Andre Perreault. But, if a seller doesn't report any such attempt to the site, there's no way for staff to know about the sale. "If there were cases of people who are licensed firearms owners selling a firearm such as a handgun or AR-15, which are restricted class and therefore registered to that licensed owner, it would not be GunPost who would find out, rather it would be the police," he wrote in an email to CBC News. 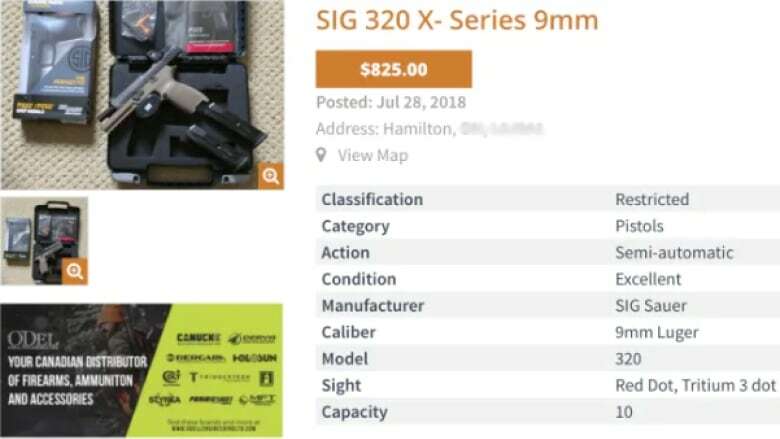 The founder's statements come after a Hamilton gun owner said she was offered more than double her asking price for a Sig Sauer P320 X-Series — a 9 mm handgun considered a restricted firearm in Canada. No1jewels, whose name CBC has agreed not to use because of fears she could be targeted by people trying to steal firearms, said she was contacted by someone interested in paying up to $1,800 for the gun, despite the asking price of only $825. When she reminded the potential buyer they needed their restricted Possession and Acquisition Licence (PAL) and asked why he or she was offering such an inflated price they texted her saying, "That's the problem. I have a restricted and unrestricted pal from 2008 ... it expired in 2013 and i don't wan [sic] to have to go through the process of reapplying going through the course system again ... it's fairly lengthy." In Canada, only people who have completed the Canadian Restricted Firearms Safety Course and gone through background and reference checks can get a Possession and Acquisition Licence (PAL) with restricted privileges. To sell a restricted handgun, the firearm must be verified and the sale must be approved by a territorial chief firearms officer. In a phone conversation with CBC, No1jewels said she would never agree to sell a firearm illegally because if she was ever caught she'd face harsh consequences including losing her licence and up to five years in prison. The gun-owner turned down the offer saying "Sorry, not a chance," and contacted police. That's exactly what should happen in a case where an attempt to illegally buy a gun online occurs, said Perreault. 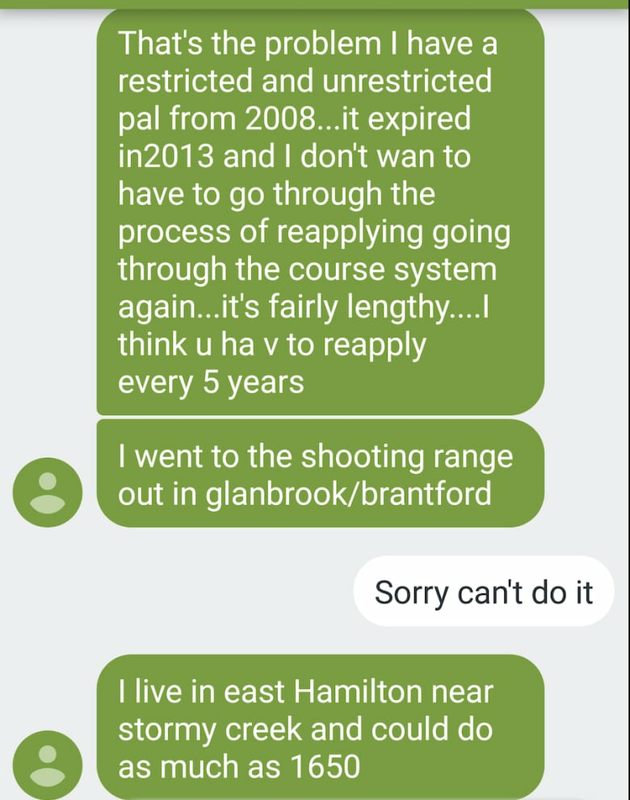 He added GunPost.ca followed the same steps both times reports of someone trying to buy firearms without the proper licence through the site were made, along with blocking the potential buyer's accounts. Perreault said restricted firearms, including handguns, are registered to their owner and each sale needs to be reported, meaning even if an illegal sale took place police would most likely be able to track the firearm back to its last legal owner. "The odds of the registered owner selling that firearm to someone without a licence and having to leave it registered in their name, are slim to none." But such sales have happened. In May a woman named Christina Stover was handed a 3½-year jail sentence after pleading guilty to four counts of trafficking in firearms — including three restricted semi-automatic handguns. Stover was charged after an employee at Wanstalls Hunting and Shooting in Maple Ridge, B.C. contacted police with concerns about her gun purchases. Court documents show she bought 16 guns between September 2015 and March 2016. Stover was what's known as a "straw purchaser": someone with a legitimate licence to buy guns — but who actually purchased them for people who can't legally do it themselves. Experts believe straw-purchasing is behind the rising number of Canadian-bought firearms ending up as crime guns. "With so many crime guns coming from legitimate domestic sources, we need effective firearm measures that prioritize public safety while ensuring fair treatment for law-abiding firearm owners," Public Safety Minister Ralph Goodale tweeted during a guns and gangs summit in Ottawa earlier this year. Similarly, after the July deadly shooting spree on the Danforth that left two dead and 13 others injured, Toronto police told The Canadian Press the number of guns obtained legally in Canada and then sold to people who use them for criminal purposes has increased dramatically in recent years. Irwin Cohen, RCMP research chair in crime reduction at the University of the Fraser Valley, recently told CBC's Jason Proctor something similar. "Traditionally, we believed that the vast majority of crime guns are brought in from the United States. And that is no longer the case," he said. "The majority of crime guns are domestically sourced."